Home > Used Vehicles > 2017 Subaru Forester 2.5i Limited w/Technology Package,LEATHER,SUNROOF,EYESIGHT,NAVIGATION,BLUETOOTH,REAR CAMERA,LOCAL TRADE!!!! 2017 Subaru Forester 2.5i Limited w/Technology Package,LEATHER,SUNROOF,EYESIGHT,NAVIGATION,BLUETOOTH,REAR CAMERA,LOCAL TRADE!!!! 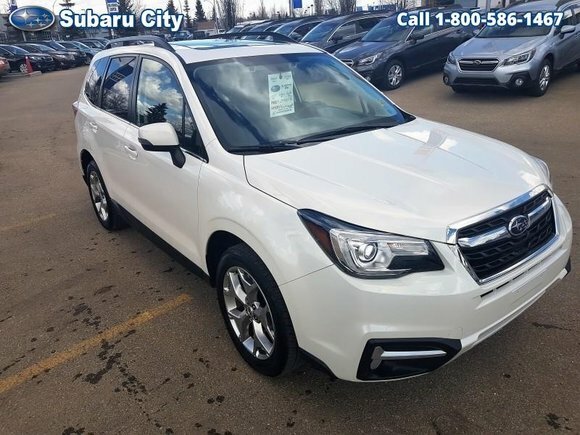 This 2017 Subaru Forester is fresh on our lot in Edmonton. Already a standout performer, the 2017 Subaru Forester has been redesigned inside and out to put even more distance between itself and the competition. This compact SUV offers an unbeatable combination of all-road/all-weather capability, superior reliability, advanced safety features, exceptional value and sheer driving enjoyment. The Subaru symmetrical full-time AWD is augmented by X-MODE, a system that offers added control when conditions are at their worst, as well as an improved ride and steering ability. This SUV has 58303 kms. It's crystal white pearl in colour. It has an automatic transmission and is powered by a 2.5L H4 16V MPFI DOHC engine. It has some remaining factory warranty for added peace of mind. Buy this vehicle now for the lowest bi-weekly payment of $195.27 with $3223 down for 84 months @ 5.99% APR O.A.C. ( taxes included, $790 Administration and Secure Ride included / Total cost of borrowing $6537 ). See dealer for details. Want to try the 2017 Subaru Forester 2.5i Limited w/Technology Package?